As a health sciences researcher, Elsie Amoako spent a lot of time studying birth outcomes for racialized women in Canada – and was disappointed with what she found. 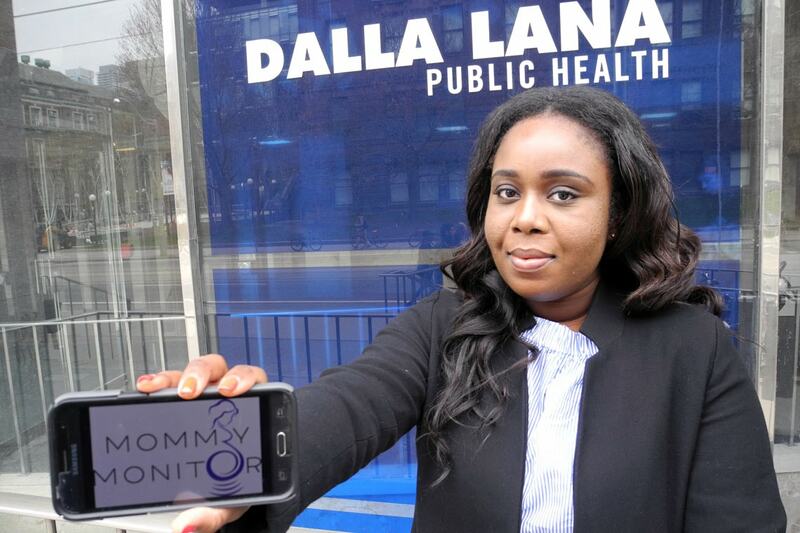 The graduate student at U of T’s Institute of Health Policy, Management and Evaluation in the Dalla Lana School of Public Health, is launching a startup that aims to improve maternal health care for Canadian women of African, Caribbean and Latin American descent. Called Mommy Monitor, the smartphone app asks pregnant women and new mothers to record key data about their lives – sleep, diet, exercise – and uses a specially designed algorithm to spot problematic patterns. The app also connects users to patient navigators – employees who are equipped to answer questions, offer guidance and refer users to a physician, if necessary. Mommy Monitor, which has so far raised about $240,000 in funding, seeks to be what Amoako calls “culturally competent” health technology. The goal is build a diverse team of assistants who can act as bridge between the app’s users and their doctors, who may not be educated in different cultural practices surrounding child birth. The idea grew out of research that shows many health issues experienced by pregnant women are influenced by social factors, according to Amoako. Studies show immigrant women in particular tend to have more difficulty navigating Canada’s health-care system and often don’t have access to the support networks available to women born in Canada. Amoako’s road to launching Mommy Monitor began in 2016 when she pitched her idea at the HealthEDGE competition, a collaboration between Toronto hospitals, industry and U of T. The competition seeks new ideas to improve Canada’s health-care system. Amoako says immersing herself in U of T’s booming startup scene was an eye-opener. “As a researcher or science and health student, we’re not always inclined to think of what we’re doing as a business, or as anything that could be a business,” she says. So how will Mommy Monitor make money? Amoako plans to target funding from government and health-care institutions to start. But she’s also considering a pay version of the service aimed at the growing number of Canadian women who are waiting until after age 35 to have children. With their pregnancies considered high-risk, Amoako says these women tend to be time-pressed professionals and may be willing to pay for a personal pregnancy assistant like Mommy Monitor. “A lot of women are lost,” Amoako says. “That’s the biggest difficulty new mothers have – not knowing what to do and not being educated enough about what to do. Or even just having questions and not having anyone to ask.